Robert Minervini is a painter who creates invented spaces based on, but slightly askew from reality. Drawing from notions of utopia and the sublime, his multi layered paintings are rooted in subject matter informed by everyday elements of growth and decay in urban environments. 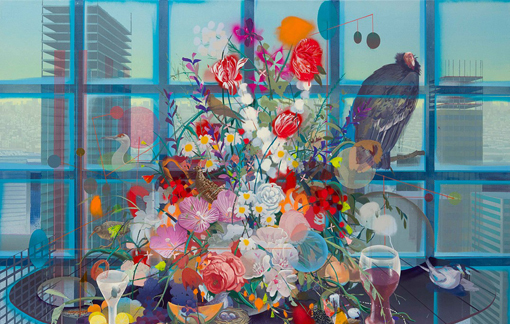 His works utilize traditional motifs of still life and landscape painting, while alluding to a parallel reality complete with ever-present reminders and markers of contemporary culture. He received his MFA from the San Francisco Art Institute and BFA from Tyler School of Art. He has exhibited nationally with Electric Works, Marine Contemporary, Eleanor Harwood Gallery, Johansson Projects, Yerba Buena Center for the Arts and the San Francisco Arts Commission Gallery. He has been awarded the Murphy & Cadogan Fellowship by the San Francisco Foundation and the Edwin Austin Abbey Mural Fellowship by the National Academy of Fine Art. He has been awarded residencies at the Headlands Center of the Arts and Vermont Studio Center. His work has been published in Beautiful Decay Magazine, New American Paintings; reviewed in Modern Painters Magazine, the San Francisco Chronicle and Art Practical. He currently lives and works in San Francisco.